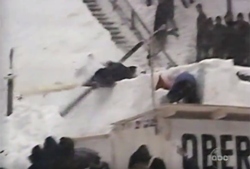 It used to be that I would see the ski jumper crashing when I thought of “the agony of defeat.” After all, we heard Jim McKay’s voice say those words to that scene each weekend when we were kids. Now, I see faces of my own kids and of athletes I have coached. Thankfully, I see those faces when I think of “the thrill of victory” too. Probably even more so. One of the hardest things about coaching T&F is that not everybody gets to be a champion. Despite the hard work and effort put in to get there. Despite the desire. Even despite the physical prowess. After all, unless you are the world record holder, somebody is always better than you. And even then, records get broken. So everybody knows the agony of defeat. The heartache of only going so far. Yes, this heartache and agony are in all sports, but the pain comes home to me when I see those faces of athletes I have coached. Those athletes in the agony of defeat. I know I cannot take all of their heartache away, but I do work to soften the blow. Often times, it is just with a word or two. With a hug and a look. Or with space. Athletes are all different. They all need different things to help them through the agony. But time does heal all wounds. Even if the agony leaves a little bit of a scar. Even if it feels like there will never be any more thrill of victory. The great thing about sports in general and T&F in particular is that there are always thrills of victory. Big and small. There is always something positive athletes can take away from a meet. Those small victories are what I like to point out. Sometimes it is that an athlete got to compete in a big meet. Sometimes I point to a Personal Record (PR) that the athlete had. Sometimes I help the athlete look to the future or even the past. Especially, if there is still a bit of agony. One of the greatest things about T&F is that I get to see smiles from those athletes who understand there are always victories. There are the athletes who know they performed better than they ever have. Those who had PRs at meets. There are also those who smile even when it was not their day. Just because there is so much to be thankful for. And there are those athletes who are champions. Even if it is just for that day. Both the little and big victories are to be savored. They are indeed thrilling. I like the victories. But there are important lessons to be learned from defeat. Lessons about sport. And bigger lessons about life. Lessons like taking the agony of defeat and turning it into the thrill of victory. That is one of the most difficult things there is in coaching. It is also the most rewarding. Indeed, it pains me to see my kids and my athletes in the agony of defeat. Like I said, I see their faces when I hear Jim McKay’s voice in my head talking about that agony. But I also see those same faces smiling when I think of the thrill of victory.